Baby Dresser Knobs and Handles. Cute Kids Drawer Pulls to Match Your Theme. We have ideas for kids drawer pulls and decorative dresser knobs that you can make yourself that will give your recycled nursery furniture a fresh new look. Buy or make a cheap pull and with the turn of a bolt you have just found a cheap and easy way to completely transform a vintage dresser or any piece of furniture that requires a handle into something really nice. Adding some decorative baby theme hardware to magically update that tired chest of drawers for use in the baby's nursery. When you change the theme, twist them off and replace them with pulls that reflect the new style of decor. Kids cabinet knobs have really caught on in the last few years and you can find them in every size, shape and color to match most any bedding set. Inexpensive kids dresser drawer pulls in popular kids themes are a quick and easy way to give your kids bedroom a makeover. Decorative drawer knobs and pulls can effectively tie a bedroom's decor together by providing furniture that matches your themed decorations. Go here to see more examples of custom pulls and the supplies necessary to make your own. 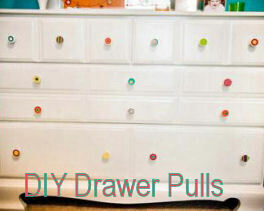 You can also make your own dresser drawer pulls that reflect the colors and style of the decor in any room. 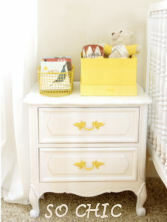 For less than $1 this night stand went from shabby to chic. A little elbow grease and a can of bright yellow spray paint gave the out-dated hardware on this vintage nightstand a completely new and more attractive appearance. 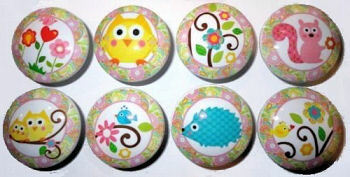 These colorful pulls replace the old knobs and were chosen to match the colors of the baby bedding. There are many tutorials that will teach you how to make your own pulls to reflect some of the most popular nursery themes. 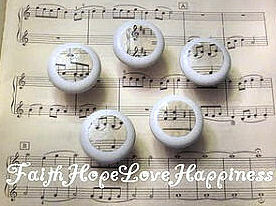 Plain wooden pulls can be painted and decorated using decals. You can also use a hot glue gun to decorate them with cut outs from a storybook. And of course there are ceramic pulls in the classic blue gingham, pink and white and any other color of the rainbow! Many of these choices have matching door knobs! There are many choices out there that make it easy for the modern hard-working mother to create a designer look in her child's bedroom. There are some top designers coming out with decorative hardware for nursery use such as Anne Geddes' nursery decorative hardware line. Meanwhile, here are some other shapes or motifs to consider"
You can really dress up a natural or a nautical theme nursery for your baby with a few cheap kids dresser drawer knobs. 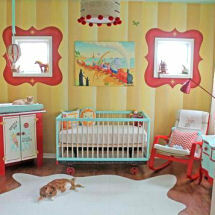 This simple decorating touch can move Plain Jane rooms up several notches on the nursery design ladder! What little boy interested in sports wouldn't love a baseball, football or soccer themed room to reflect his unique personality and interests? Or if your little guy is more interested in the outdoors and wildlife, you can find drawer pulls as generic as pine cones or as specific as fish or even a friendly Moose Head Knob that would look fantastic in a rustic cabin style of decor You can buy Alaskan Moose Light Switch Plates in large or small sizes. A smart shopper always bears in mind the construction of anything that may be used in kids' rooms. For babies and toddlers, there are safety concerns and for older children durability is an issue. Always examine the screws that will attach your hardware to your furnishings. They should be well anchored to the decoration and the threads should be well defined with little chance of stripping. Decorative pulls can be made of several different materials. Of course, the knobs of solid metal including the decoration will be the least likely to break or fail. You may wish to use metal on your pieces that will be used the most. Save the other styles for areas that are mainly for looks or places that will be out of reach of the kids. For more ideas on ways to use drawer pulls to dress up your baby's nursery furniture take a look at some of the other pages on this site! Unique Baby Gear Ideas has many more tips on how to give your baby's dresser a makeover using inexpensive hardware replacement as well as nursery decorating ideas so please take a minute to check out our gallery of nursery photos and the tips shared by real moms just like yourself that have used up-cycled nursery furniture to keep the cost of their project down!